For the Second Era adventurers who quested for the Amulet of Kings, see Five Companions. The Companions are a group of warriors who take on private and public contracts for the people of Skyrim, and who purportedly carry on the tradition of the Five Hundred Companions of Ysgramor. Although the two groups offer a similar service, the Fighters Guild historically had a strong presence in Skyrim until the Companions seemingly replaced it entirely in the Fourth Era. 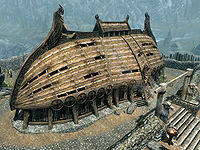 They are based in the city of Whiterun, within the mead hall Jorrvaskr. The most elite members are included in the Circle of Jorrvaskr, and the chief councilor and arbitrator is known as the Harbinger, after Ysgramor, the "harbinger of us all" and the only real recognized leader of the Companions. Each new Harbinger is chosen by the last. The Companions have had an enormous impact and influence throughout Skyrim in the course of recorded history. When Ysgramor and his two sons Yngol and Ylgar returned to Atmora after the Night of Tears, the Five Hundred Companions were those who answered their call to arms for war against the elves. One of them was Jeek of the River, captain of the ship Jorrvaskr, Ysgramor's childhood companion, and the first Harbinger (besides Ysgramor himself). Jeek was also the keeper of the now-forgotten Oath of the Companions. Jeek and his crew were Ysgramor's closest friends, and the first to break away from the main group and explore the dangerous wilderness following the reconquest of Saarthal. They found the Skyforge, an ancient forge of unknown origin which predated elven habitation of Skyrim. The elves avoided and feared it, as "it was known to drive a magic almost as old as Nirn itself, some remnant of the gods' efforts to render a paradise in Mundus before the shattering of Lorkhan". The Companions thought anything the elves feared must be worth having, and since the land around the area was fertile, Jeek of the River established the Jorrvaskr mead hall and the city of Whiterun. 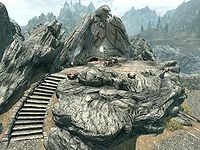 Aside from the Jorrvaskr, the Companions also arrived to Skyrim aboard other ships, including the Kaal Kaaz, the Krilot Lok, the Fallowfire, the Sadon Reyth, and the Ylgermet. The Circle of Captains decided that each ship's crew should go forth on its own accord and make its own legend. The crew of the Fallowfire traveled south, to the lands yet unexplored by other crews, and eventually arrived to a region they called the Rift. They fought and eventually defeated the elves that inhabited the region, and the new captain, Vikord One-Ear, ordered the construction of a great hall on the site of the final battle. The hall was named Fallowstone Hall, and served as the headquarters of the Rift Companions for centuries. However, no trace of it remained by 4E 201. Several hundred years later, after the Companions had been established as an independent mercenary group, the Harbinger Mryfwiil the Withdrawn feared that the participation in wars and political conflict would destroy the group and decreed that Companions would not be party to wars or political conflicts of any kind. Ever since, the Companions have become lauded in Skyrim as impartial arbiters on matters of honor. At a time when racial prejudice and talk of maintaining the purity of Atmoran blood threatened to break the peace in Skyrim, the Redguard Cirroc the Lofty was made the first Harbinger not of Atmoran descent, likely helping to allay concerns of whether other humans could "be born with the heart of a Nord". Cirroc's reign was brief, although he did install a martial prowess in the blade work of those he taught. Generations later, the Elf Henantier the Outsider was named Harbinger after outlasting all others better suited to the role, thus cementing a tradition of racial tolerance in the Companions (causing a substantial number of Companions at the time to leave). The Companions can also claim at least one woman as a former Harbinger, Macke of the Piercing Eyes. In the late Second Era, Kyrnil Long-Nose "gathered the true hearts of the Companions in the wilds" and invaded Jorrvaskr, "killing the usurpers" and becoming Harbinger. He founded the Circle, named after Ysgramor's Circle of Captains. The elite Companions of the Circle served as examples to other members and effectively formed a governing body bent on venerating the old ways of "honor through blood". Secretly, however, the Circle and subsequent Harbingers had been practicing Lycanthropy pursuant to an agreement with the witches of the Glenmoril Coven, who had established a presence in Skyrim. The specifics on how this agreement came about and the parties to it are not known. Though Long-Nose created the Circle and is lauded for "returning honor through blood" to the Companions, a Harbinger named Terrfyg is credited with first turning the organization to "the ways of the beast". Regardless, the Circle accepted this "gift" from Hircine as payment owed to them by the witches for services rendered, but were deceived into believing it would not be a permanent affliction. Around 4E 201, some members of the Circle, led by Harbinger Kodlak Whitemane, would eventually conclude it was not a gift, but a curse with serious spiritual implications, and worked to eliminate it from the Companions. During this time the group were targeted by a group of werewolf hunters called the Silver Hand who succeeded in killing several members of the circle including Harbinger Kodlak Whitemane himself. Seeking revenge for the death of their leader, the companions wiped out the Silver Hand at their hideout. The Glenmoril Coven was also destroyed by a new warrior on orders from Kodlak before his death. Using the severed heads of the witches, the surviving Circle members cleansed themselves of their beast blood and also cleansed Kodlak's soul, allowing him to go to Sovngarde. 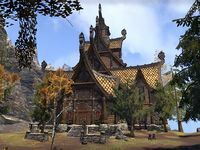 For game-specific information, see the Skyrim articles on the Companions, the Circle, and the Harbinger, or the ESO article on the Companions.